Atopic dermatitis is an inherited skin allergy directed against environmental substances such as pollens (from weeds, trees, and grasses), mold spores, or dust mites in the house. It is caused by a combination of immune system overreaction and a weakened skin barrier. Itching and redness of the skin are the most common signs, and it usually affects the face, feet, ears, body folds, and belly. Itching can be seasonal or year-round. Patients also get frequent skin and ear infections with bacteria and yeast, which will make them even itchier. A dermatologist will put together all the clues from your pet’s history and physical exam, and rule out other diseases such as food allergy, flea allergy, and scabies. 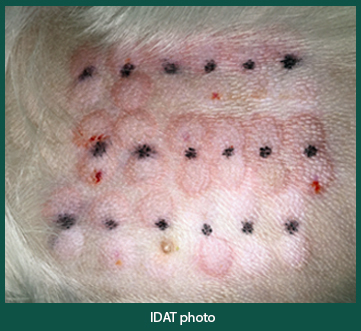 Once the diagnosis is made, we perform intradermal allergy testing to identify which pollens are causing the problem. Blood, saliva, and hair allergy tests are marketed as an alternative, but their results are not accurate. Allergies in pets are controlled but never cured, so lifelong treatment is needed. The safest option is allergen-specific immunotherapy (“allergy shots” or “oral allergy drops”) to desensitize the immune system. This has an 80-85% success rate and no long-term side effects. Other anti-itch drugs include antihistamines, omega-3 fish oils, steroids, Atopica, Apoquel, and CytoPoint. Most pets need a combination of treatments to keep them comfortable, but our overall goal is to keep your pet comfortable with the safest possible options to avoid long-term side effects. Contact our clinic if you think your pet could benefit from allergy diagnosis and treatment!